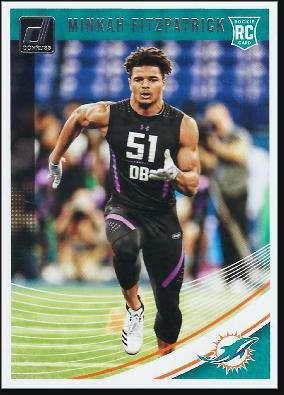 Minkah Fitzpatrick was born November 17, 1996 in Old Bridge. He was a talented all-around athlete who gravitated to football in the town’s youth sports programs. Minkah attended St. Peter’s Prep for high school, carpooling to Jersey City with the school’s head coach, Rich Hansen, every day. There he became a two-way standout on the football team at receiver and defensive back. He amassed 1,111 receiving yards and scored 12 touchdowns as a senior in 2014, helping St. Peter’s win its first state championship since 2005. However, it was as a shut-down cornerback that he achieved 5-star status as a college recruit. Minkah learned about hard work and overcoming adversity off the field after Hurricane Irene destroyed his family home in 2011. He would work with his father school every night to repair and restore their house. Coach Hansen gave Minkah the keys to his own house during this time so he could stay focused on schoolwork and stay out of trouble. Minkah had already decided as a junior that he wanted to go to Alabama and the Crimson Tide was happy to have him. He cracked the starting lineup as a freshman in 2015—unusual for a Nick Saban-led team—as ’Bama won the national championship. Minkah was honored as a Freshman All-American. In 2016, Minkah had six interceptions. Half of those came in one game agains Arkansas, including a pick at his own goal line that he returned 100 yards for a touchdown and new school record. He set another record seven games later when he returned an interception for a touchdown in the SEC title game against Florida—the fourth time in his young career he had a “pick six.” The Tide finished the year ranked #1 in the nation in points allowed and yards allowed per game. The only blemish on their record was a 35–31 upset at the hands of Clemson in the national championship game. Minkah was named an All-American at safety as a sophomore. Minkah played one more season for Alabama, and earned unanimous All-America honors as a safety. The Tide lost just one game, in November to Auburn, but won the national championship with a thrilling overtime victory over Georgia. Minkah copped the Bednarik Award as the top college defender, as well as the Thorpe Award as the best defensive back. He decided to forgo his senior year and declared for the draft. He left ’Bama as one of Coach Saban’s all-time favorite players. Minkah was selected with the 11th pick by the Miami Dolphins. He was the fourth defensive player taken in the draft. Tide teammate Daron Payne went two picks later, to the Redskins. Tide linebacker Rashaan Evans and wideout Calvin Ridley also went in the first round. Minkah’s safety partner at Alabama, Ronnie Harrison, was taken by the Jaguars in the third round. The Dolphins saw from the first day of camp that Minkah was a good fit for their club. He had the speed, range and instincts to play free safety in the NFL, yet at 6’1” 205 lbs. he had the muscle to cover tight ends and slot receivers, too—giving the Dolphins a lot of intriguing options on D. Miami fans looked forward to his pairing with veteran safety Reshad Jones, a Pro Bowl pick in 2015 and 2017, on a revamped defense that was one of the most porous in the league.